Besides being a great source of fibre and complex carbohydrates, gold sweet potatoes are very rich in beta-carotene- hence the brilliant colour. They’re also very yummy, especially when roasted! Serve this as a side dish at dinner or add some pan-fried tofu to boost the protein content for a light meal. 1. Preheat oven 180°C. Roast pecans 5 minutes. Cool and break into halves. 2. Increase oven temperature to 200°C. Toss sweet potatoes in sesame oil, salt and pepper. Roast for about 40 minutes, or until lightly golden. 3. Meanwhile, whisk miso with 1 Tbsp hot water, brown rice vinegar and a pinch of salt. Toast one side of the nori in a dry pan until it turns bright green then crumble immediately. 4. When the sweet potato is almost ready steam cavolo nero over boiling water for about 2 minutes, or until it just collapses. 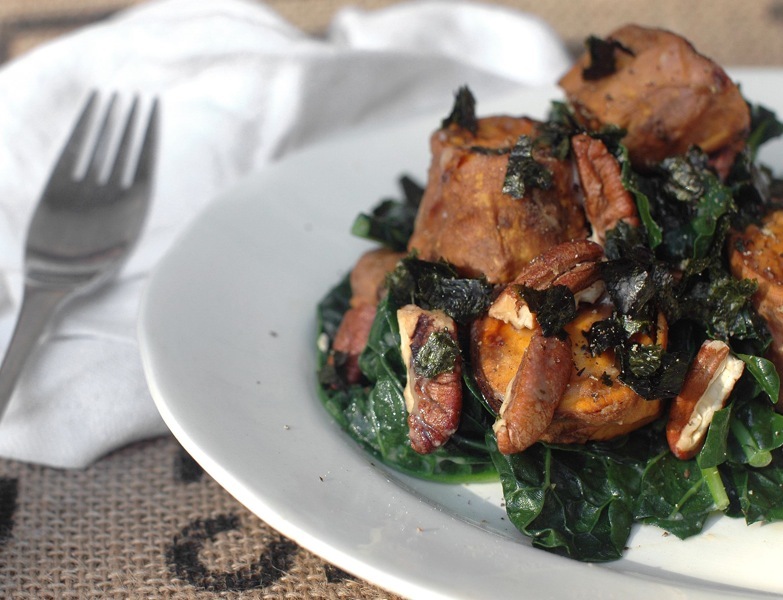 Toss the sweet potatoes with miso mixture then add cavolo nero and pecans. Top with toasted pecans and serve.